The Coleman Institute for Cognitive Disabilities works to catalyze and integrate advances in technology that promote the quality of life of people with cognitive disabilities and their families. Cognitive disabilities include; intellectual disability (ID), Alzheimer's, brain injury, stroke, and serious, persistent mental illness. We welcome all interested individuals to participate in the 143rd Annual Conference of the American Association on Intellectual and Developmental Disabilities (AAIDD) – the oldest and most prestigious professional organization for those in the disability field. 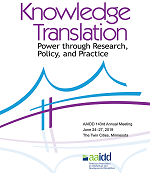 The 143rd AAIDD Annual Meeting will provide a forum for researchers, practitioners, policymakers, students and advocates to learn about innovations in our field that are being translated and implemented on a grander scale. Through knowledge translation we can change practices and policies through effectively communicating our research and creating change at all levels. In a political climate that is complex and dynamic, it is important to remain relevant through the thoughtful translation of our knowledge.